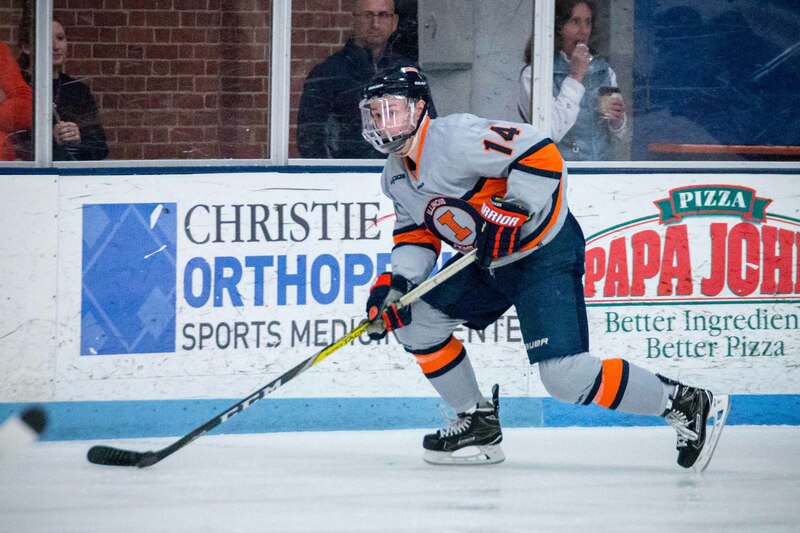 Illinois' Chris Lozinak (14) carries the puck up the ice during the game against Robert Morris at the Ice Arena on Saturday, Feb. 18. 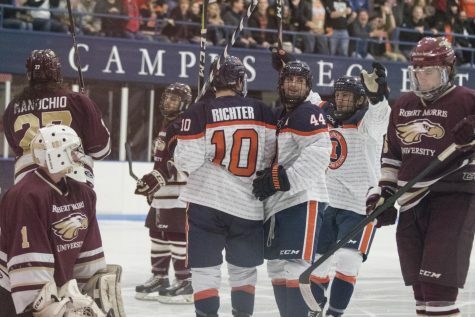 Illinois hockey will be very familiar with Robert Morris by the end of next week. The Illini and the Eagles split Illinois’ final series against Division I opponents this weekend. The teams will face off for the third time in eight days Friday night at the first round of the CSCHL tournament. No. 6 Robert Morris (22-9-4) is hosting this year’s five-team conference playoff at The Edge Ice Arena in Bensenville, Illinois. 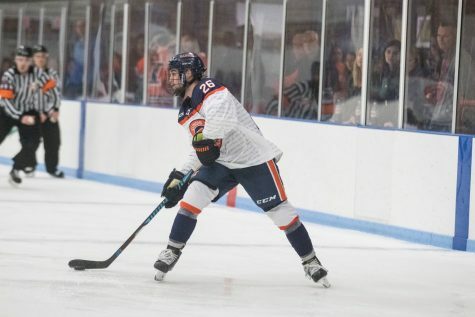 Illinois junior forward Chris Lozinak got the scoring going in the first period during Friday’s 5-1 win with a breakaway goal past Robert Morris goalie Cole Semchak. 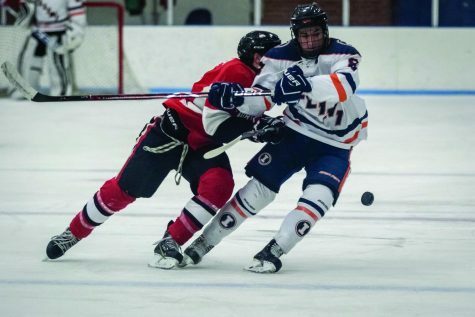 Illinois (20-9-3) took a tough blow late in the first period when freshman forward Luke Forfar was ejected from the game for a late hit on Robert Morris defenseman Jake Floro. The Illini killed off the five-minute major. Illinois did not allow a power play goal on Friday. Robert Morris scored two power play goals Saturday. No. 14 Illinois split last weekend’s series against No. 2 Ohio. 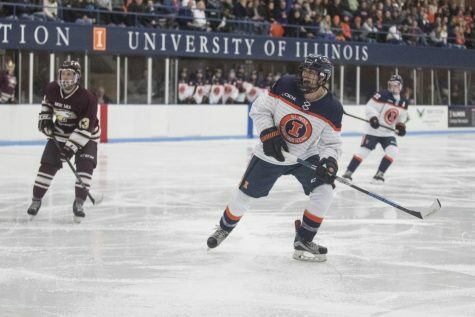 Two Bobcat goals during the weekend were the result of the Illini’s inability to clear the puck, an area Illinois improved upon this weekend. Senior forward Eric Saulters said the offense starts clicking when Illinois gets the puck out of its defensive zone. 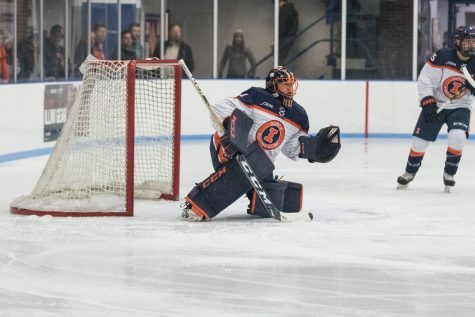 Illinois’ five Friday night goals came off the sticks of five different Illini. Fabbrini said Illinois’ depth will pay dividends in the playoffs. 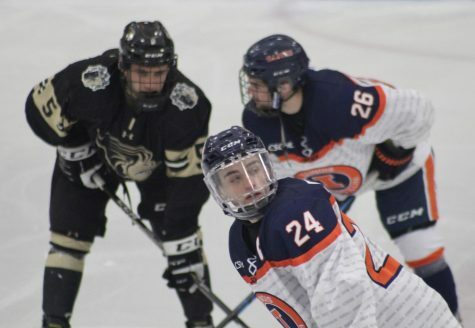 Robert Morris stole Saturday’s game 3-2 behind a late third-period goal from forward Scott Coash. 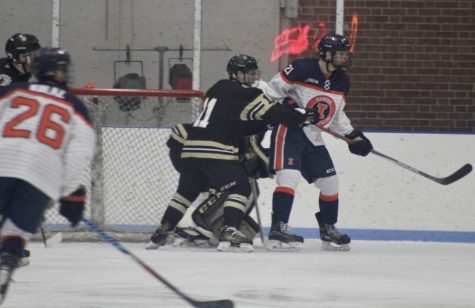 Illinois top-line forward James McGing was ejected from Saturday’s loss after picking up two ten-minute majors. McGing, who has an arsenal of stickhandles, is suspended for the team’s next four games. 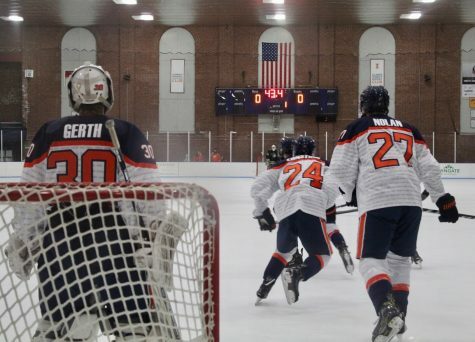 Illinois honored its five seniors – goalies Joe Olen and Zev Grumet-Morris, defenseman Aaron Dusek, and forwards Austin Zima and Saulters – and Lozinak, a graduating junior, before Saturday’s game — their final career game at the Big Pond. The seniors and their families participated in an on-ice ceremony prior to the game. The Illini conclude the regular season March 3 and 4 on the road against Division II Augustana in Oak Lawn, Illinois. They will compete in the ACHA National Tournament beginning March 9 if they finish the regular season inside of the top-20 national rankings.